Miss Mandi over at ItsCome2This.com has given us an assignment for this first Saturday of the new year. We’re supposed to highlight blogs that we’ve “stumbled upon” and loved in 2010. FUN! Since I truly didn’t get into this bloggy thing until January of 2010, pretty much all blogs are new to me. In fact, I shared a list back in February of what I was reading in my new bloggyness. Interestingly, my list hasn’t changed much. Below is a list of blogs I read almost daily. These women have become people near and dear to my heart. I laugh with them. I cry with them. They challenge me to be a better person, wife, and mom. I am so thankful to have them in my life even if they are just there virtually. I am SO EXCITED that I will get to meet many of them at Blissdom at the end of the month. Ohamanda: I knew her IRL before I knew her through her blog. What I love about her blog is that it is HER, just on the computer screen. She is an amazing person. She also has another blog, Impress Your Kids, which is fabulous for you preschool (and older) moms. GREAT for homeschoolers too. ItsCome2This: An IRL friend of Ohamanda and now one of mine. I met her through her blog and then for real at my Baked Bean Showdown. I’m planning on helping her some with her newest venture, CummingLocal.com. She too is true to life on her blog, and I love her perspective on life. The Finer Things In Life: Oh how I enjoy Amy! If we lived in the same place, we would hang out regularly. Well, at least I would want to hang out with her. She just SHINES on her blog, and I smile every time I visit over there. I aspire to be more like Amy. Once A Month Mom: I adore Tricia. ADORE her. Her blog is awesome! I mean who takes the time to plan out a month’s worth of meals for you… for free? It’s fantastic. And, she’s an amazing person too. We’ve gotten to know each other more through Twitter and her monthly Facebook chats. I CANNOT wait to hug her neck at Blissdom since I missed her when she came in town for her TweetUp. Giving Up on Perfect: I MUST include Mary on this list as her blog changed my life. It really did. And, she’s fun and real and an awesome mom and I can’t wait to ROOM WITH HER at Blissdom. Blessed indeed. Head on over to Saturday Stumbles to find out who everyone else discovered in 2010. I have a feeling I’ll be doing a lot of blog hopping this weekend! 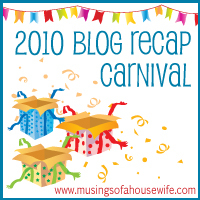 I’m so excited that I’m able to do the Blog Recap Carnival this year. I remember reading tons of them last year and sad that I was unable to do one. I hadn’t really blogged much at all in 2009. However, in 2010, I did some blogging people! Whoop! I did enough blogging that I actually have a “first” post of every month (rather than the “only” post of the month in 2009). This is how it works. I’ve linked to the first post of each month of the year, given you the first line, and then a quick synopsis. Feel free to click through the year with me. It’s rather like a quick scrapbook of an entire year. JANUARY: We’re back from our quick couple getaway in Tennessee. We had just returned from a fabulous couple time weekend getaway, and I was about to head into the new year doing a pantry challenge. This post actually lists my pantry inventory – exciting stuff huh? FEBRUARY: Somehow it is already February of the year 2010. Wow! Obvious statement there. This is actually a Top Ten Tuesday post about all that was planned for February 2010. It was a busy month! MARCH: How is it possibly March already? Okay… I was seriously have an issue with how fast the year was going by. This was a Menu Plan Monday. It has the link to the pork dumplings I was thinking about the other day. I need to make those again. APRIL: I have a secret for my recently acquired will power (besides all your prayer cover that is). Oooohhhh…Now, this is a good first line. This is a Things I Love Thursday post all about something that was helping me not eat. I’m not going to tell you what it was. You gotta click the link. MAY: Well, I’m home from my conference, and the hubby is off to his. Then end of April to beginning of May is craziness at the House of Hills due to our work conferences. However, in 2011, they aren’t back to back. Can I get a sigh of relief there. 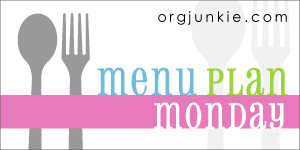 This is a Menu Plan Monday post with only one recipe link. Feel free to skip this one. JUNE: Summer has fully arrived here in the South. Ahhhh… summer. 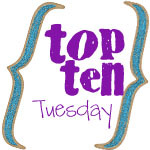 This is another Top Ten Tuesday about the senses of summer. I like this one. It makes me smile. JULY: Hello Losing It! Ladies! This was a Losing It! Friday where I check in with all my Losing It! friends. Losing It! changed my life this year. It truly did. AUGUST: We love “Brinner” at our house – that’s breakfast for dinner in case you didn’t know. Ahhh… “Brinner” – what do you have when you make “Brinner”? SEPTEMBER: Okay people! We are settled in our new home. This was another Menu Plan Monday. The first in awhile. We had just moved into our temporary home. I can’t believe we’re moving again in a few months. Ack! This one has a link to our favorite Garlic Shrimp that we eat ALL the time. OCTOBER: Happy October Losing It! Ladies!! Another Friday. 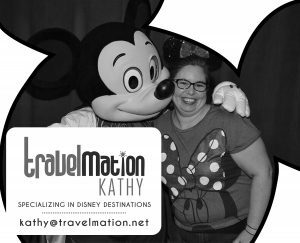 This is where I lament that I TOTALLY fell off the wagon while on the Disney Cruise. TOTALLY. NOVEMBER: Today was the first day of The 30-Day Giving Challenge, and I woke up bright and early to make sure I got my give done. I LOVED the 30-Day Giving Challenge. It was so great to focus on giving for a full month. 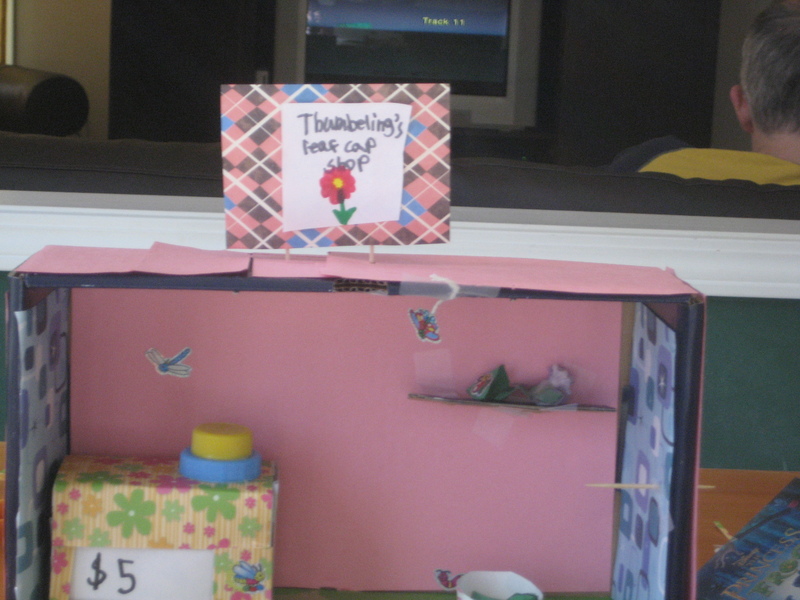 This post is the first of MANY in the month of November all about giving. DECEMBER: We were traveling for Thanksgiving and needed to pack some snacks. So, there you have it. The first post of each month of the year. You know what… I do a lot of the same thing each month. I wonder, is that a good thing or a bad thing. Good because everybody like to know what to expect or bad because I might be in a blogging rut? Hmmmm… gonna have to think on that one. To see more fun recaps, head on over to Musings of a Housewife. Made the Ziti last week for small group. They LOVED LOVED LOVED it. A GREAT recipe for a crowd and for in the freezer. Another discover last week: Aldi chicken tenders. They are very tasty and Princess approved. Also, not too many calories per tender. A great find ’cause they’re not that pricey. Whoop! Monday: Date Night – not sure what we’re doing, but I ain’t cooking! Tuesday: Leftovers – we’ve still got stuff in the fridge from last week to eat. Not a very exciting week, but that’s the plan. So thankful to have stuff in the freezer. All I have to buy this week is produce and milk! Whoop!! Want some more menu ideas? Head on over to Orgjunkie.com and see what others are cooking! I haven’t gotten into stumbling yet. And, I hardly got to retweet this week either. The majority of my computer time this week was spent WORKING! And, it will be until May. That’s just the way it goes. But, here’s some of the posts I read this week that I thought you should too! Enjoy!!! Somebody Wants What You Have at The Finer Things in Life – A GREAT read! Get a tissue. March Menu at Once A Month Mom – I’m already planning for my next big cooking day. I had a blast last Saturday cooking up a storm and am loving having a full freezer! Creamy Baked Mostacolli at Cooking During Stolen Moments – I LOVE this blog. She always has great recipes. This is one I want to try even though I’m not sure how to say that last word. I’m thinking the next time I have to cook for Small Group. Day 4:My Rescue at We Are That Family – Need another tissue for this one. Kristen was in Kenya last week and got to meet the children she sponsors with Compassion. If you don’t know about Compassion, take some time to check them out. They are an amazing organization and do so much for children in poverty around the world. Those are just a few of the things I read this week. 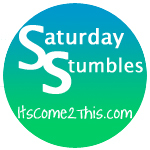 You can see others favorite posts from the week over at Saturday Stumbles. 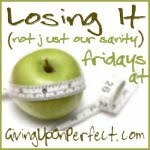 It’s Friday again (not sure how that happened so quickly) and time to check in on how I’m “Losing It -and not just my sanity.” However, I think I lost more sanity than weight this week, but alas. Okay friends, anyone remember what I was supposed to work on this week? Anyone? Anyone? Did you read last week’s post? Yes! Then you know I was supposed to add exercise to the program. Ummmm…. ya, about that. I do now own some exercise DVDs thanks to my fabulous step-mother-in-law. You know, the same one who got me the Food Loop. She’s pretty good at the practical gifts. Love that. Anyway, she sent me a set of her favorite exercise DVDs, POWER FIT. 1. Drink 8 glasses of water a day – NO PROBLEM! 2. One sweet treat a day – NO PROBLEM! Well, was almost a problem on Thursday, but I curbed it. I am also making sure I put any sweets in my calorie count. And, anyone that knows me knows that this not being a problem is an act of God. I’m not kidding. He is so helping me out here. 3. Nothing Deep Fried – Only slipped once when I ordered a salad that had chicken tenders on it. I hadn’t thought it through. 4. Exercise 4 out of 7 days – Ummmm… see above. Again, which goal needs work – that exercise goal. The bane of my existence. Uggh! Weight Loss – 1.5 pounds. Not bad, but not as good as last week. Need to watch what kind of calories I’m putting in my mouth. And, I had several work restaurant lunches this week – HARD to watch calories then. I overall am feeling better than I did before I cut out sweets, Diet Coke, and various other yucky stuff. I am listening more to my body and only eating when I’m actually hungry rather than when I feel like eating. This is huge for me. I’m a big emotional and boredom eater. Those are all bonuses for me! UPDATE: I wrote the above Thursday night. This morning, I DID get up and exercise for 20 minutes. My legs and arms hurt, but I’m VERY proud of myself. Now, let’s see if I can keep it up! Check in at Giving Up on Perfect to see how the rest of the Losing It! ladies are doing. I’m going to go cheer them on. I am an avid reader. Well, I used to be and sometimes still am. I have the unfortunate need to finish whatever book I’ve started – before I go to bed. That’s right, I need to read them in one sitting. I am so jealous of those people who read every night before they go to bed. Can’t do it. Well, I can, but then I don’t sleep well. I think about the plot and how it’s going to end. I need the closure. This is all for fiction of course. Non-fiction, I can put down. Which may be why I don’t read it as much. I listed my reading goals for the year earlier back in January. I already had several of the books on that list, but I needed to obtain the rest. My favorite way to get books – Paperbackswap.com. If you aren’t using Paperbackswap.com and you read, you are SO missing out. It’s the best place to get books and to get rid of books. Basically the way it works is that you list the books you want to get rid of and then get credits when people ask for them. Yes, you have to pay shipping to get those books out of your house. However, you can send them media mail and so it’s rarely much over $2. Once the receiver marks your book as received, you get a credit which can be used to order a book from the website. That means you’re getting a book for around $2, which is less than most used book stores. The best part – there are literally millions of books posted so you can search to find that exact book you’re looking for. And, your book will probably be mailed pretty quickly. The exception of course is current best sellers. There is always a waiting list for those. The website explains it even better here. I put two of the Princess’s books in the mail yesterday. I purchased the postage right on the site so I didn’t have to go to the post office and got instant credit. They went in the mail yesterday, and I can now order two more books if I want to. Paperbackswap.com has really come in handy as the Princess has begun to devour a book a day. She seems to have the same problem as her mommy and finishes books at an insane rate. She also likes book series. So, it’s great to get a bit ahead of her! She’s got two left in Magic Tree House, is on the last Harry Potter, and is waiting for the next Kingdom Keepers to come out. She’s read every Captain Underpants and almost every Geronimo Stilton. Any other series we should try? Paperbackswap.com – I love it! And you will too! If you decide to try it out, tell them “kathill” sent you. For more things folks love, check out Things I Love Thursday over at DiaperDiaries.net. Disclosure: All opinions above are my own. Nobody asked me to write about Paperbackswap.com. Yes, if you put my name as referrer, I’ll get a book credit. However, that’s not why I’m telling you about it. I just think it’s awesome and wanted to share. I had a big cooking day on Saturday, so will hopefully be pulling from that all month. I love just pulling stuff out of the freezer. Here’s the plan for this week. For more great menu ideas visit Orgjunkie.com. Whew! I did it!!! I made twenty-five meals plus some breakfasts in about 6 hours. Wahooo! I started my cooking day at 6:30AM. Yes, I know that’s early. However, the Princess is up at 6:00 usually – even on a Saturday. I figured since I was up, I might as well get started. I had my plan in place. I just had to execute it. The plan actually started Thursday night. That’s the night I went shopping. I twittered that I was shopping for the cook off and even got encouragement from the Once A Month Mom herself. I felt so honored. I came home with my goodies, and immediately put all the chicken in the crock pot to cook overnight. It is recommended that you put water in with the chicken. I don’t use water. I use Kraft Zesty Italian dressing that I get on sale and with coupons. So, I always have lots in my pantry. For a full crock pot of chicken, I used a whole bottle of dressing. I really like the flavor it gives the chicken. I had never done chicken overnight before. It worked well. The only issue was that the house smelled SERIOUSLY of chicken the next morning. If I had been pregnant and smelling that on an empty stomach, I would have been heaving. As it was, I was slightly queasy. But, the chicken was done! I shredded it Friday morning and put it in the fridge. My plan was to make the granola Friday night, but that didn’t happen. I had an INSANE work week and was just plain beat by Friday night. I did manage to get the ground beef into the crock pots, and that cooked overnight to be ready in the morning. We had the same smell issue the next morning, but it wasn’t as disturbing as the chicken. And, I was thankful that all the ground beef was cooked. I think in the future, I’ll cook the meat during the day before so as not to deal with the smell issue and then just refrigerate until I am ready to cook. I had chosen recipes with very little chopping of veggies needed. This was just perchance. I didn’t plan it that way. I did need some onions, but I cheated and just used frozen ones I had purchased at Publix. They’re not as strong in flavor as fresh chopped onions, which My Sweetie actually prefers. I also needed some chopped garlic. Again, I cheated and used the stuff from the jar. So, the only real chopping I had to do on cooking day was some green onions. I started the morning making pancakes. I had originally planned on making Banana Pancakes, but the Princess wanted some pancakes for breakfast, and I knew she wouldn’t eat the banana ones. So, I just made plain ones using the same recipe. I did however use half wheat flour and half unbleached – trying to get them a bit healthier. They were very good!! We had some for breakfast, and I got 4 BAGS for the freezer. After I had fed the family, I quickly mixed up a Quiche and put it in the oven. Once it had cooled, I cut it into six pieces for six breakfasts for me at the office. Next, I mixed up the Granola and got that into the oven. That granola – it BE GOOD! My Sweetie had some last night, and I had some this morning with my yogurt. Yummy! It made enough to fill a Tupperware large oval modular mate. I started the meal preparation off easy by making the two dishes I had chosen that just needed marinades and then went straight to the freezer. I whipped up the Pork Chop Marinade from The Big Cook cookbook and the Asian Pork Loin Marinade from the $5 Dinners cookbook. That was a quick six meals prepared. I then moved on to the ground beef portion of the morning. I made a triple batch of Ziti. (The noodles had been boiling while the marinade prep was happening.) It made six pans to give away – I usually give away ziti to those who need a meal. I also made one large pan for small group Monday night. I’m really thankful I remembered I was in charge of food this week! Because I added a bit more meat to the small group pan (those men love some meat), I only had enough meat to make two batches of Sloppy Joes (from The Big Cook). Once I had used up all my ground beef, I pulled out my massive container of shredded chicken. I mixed the topping for the Chicken Ranch Pizza, but didn’t use tomatoes. The House of Hills is not a fan of tomatoes in their natural state. Add a bit of sugar and make some ketchup – then we’re happy. I filled four quart baggies with topping. I then combined everything but the black beans together for Chicken and Black Bean Quesadillas. I already have black beans in the freezer, so I’ll just pull a bag of this mixture and a bag of black beans when I’m ready to make the quesadillas. I made enough for six meals. My final project for the day was Pizza Crusts. They were so EASY to make. I will never buy pizza crust again. And, I used half whole wheat and half unbleached flour, making them better for us than the ones at the store. Those went into the freezer, and I can’t wait to use them. That was it! During that whole cooking morning, I also helped the Princess do her project for school, made lunch,did two loads of laundry, and cleaned the kitchen as I went. I took my apron off at 1:00, six-and-half hours after I had put it on. 25 MEALS IN SIX HOURS. Not bad for a day’s work. It would take me much longer than that if I made them individually. How much did these meals cost me? More than they should have. I did the bulk of my shopping on the Thursday before cooking at Publix. I had some coupons, but I wasn’t shopping smart. I was shopping because I needed stuff. NOT the best way to shop. If I had planned better, I would have gotten the pork loin and ground beef at BJs. I would have gone to the Tyson factory and picked up frozen chicken breasts for pennies a piece. I would have been watching the sales all month for what I needed. I would have decided what I was going to cook at the beginning of the month instead of days before. That’s the way Once A Month Mom teaches us. I did not obey teacher. So, I paid more. I spent $160 on stuff for the cooking day at Publix on Thursday. I already had the pork chops in my fridge and used baking supplies from the pantry. So, let’s say a total of $180 spent. That’s $7.20 a meal. Not bad, but it could be SO MUCH BETTER. I’ve challenged myself that next month I’ll get it cheaper. If you’ve never cooked in bulk, I recommend you try it. It could change your life – really. I almost forgot. The coolest thing about doing the cooking THIS WEEKEND!! I can enter this post in the Cook Off contest going on over at Once A Month Mom. I might win a food processor! I SO NEED ONE! There were going to be pictures right here, but for some reason my computer is NOT cooperating with me at the moment. I will add them when I can.